This beautiful EFFY blue sapphire ring features a double diamond halo and is crafted of solid 14k white gold. 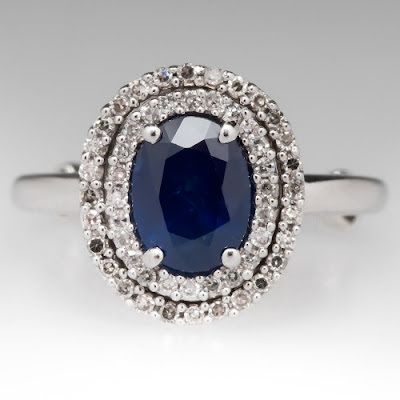 The genuine blue sapphire is a deep, dark blue and weighs 1.65 carats. It is surrounded by 50 round single cut diamonds with color varying between G and H. This gorgeous ring is a testament to the craftsmanship of EFFY jewelers. Effy Hamatian, founder of EFFY, oversees the design and craftsmanship of every one of the hundreds of pieces his house produces every year. Each EFFY jewel shines with the brilliance and luster of Effy's attention to detail and meticulous designs. With EFFY, you're guaranteed precise and vibrant colors. All of their gemstones are selected and matched by hand to ensure perfection. Black rhodium, while not used in this piece, is often employed by EFFY to add depth and enhance the colored stones. Every piece of jewelry is comfortable for daily wear and smooth to the touch. At EFFY, every piece goes through rigorous quality testing, in accordance with the founder's insistence that those who wear his jewels deserve the absolute best in quality. Mr. Hamatian entered into the jewelry business more than 30 years ago with an engineering background. He believes that his electronics experience affords him the ability to recognize the importance of the smallest of details. He sees things that others might miss. Effy is always in search of new inspiration, drawing from nature, world travel, and anything that moves him and stirs his passion. His designs are intended to inspire a sense of adventure and to transport you to new places even if you're sitting at your desk or on your couch. Effy works alongside his two sons, Benny and Bobby, in their West 46th Street studio in New York City. Benny Hamatian tells his children that their grandfather has truly realized the American dream. Thirty-five years ago, he arrived in New York with nothing except his strong devotion and faith in God and an outstanding work ethic. With these tools in hand, he established his leading jewelry design firm and inspired the next generation to take up the reigns beside him. Effy's sons are as passionate about jewelry design and manufacture as he is. They love what they do, and they love working with their father. Bobby Hamatian believes that two things separate EFFY from the rest: (1) Endless opportunities to express your unique personality and interests, and (2) The highest quality in craftsmanship. "To have the opportunity to put a smile on peoples' faces and be a part of their happy occasion is what drives me to build this brand and to come to work every day," he says. For those in search of bold, stylish jewels to complement their every whim and mood, we cannot more highly recommend EFFY jewelry. We invite you to make an appointment to come in and meet with us to try on our selection of EFFY jewels. Are You An Op Art Bride?